Dave Petrovic started his career as an Producer / Engineer in 1995 and is currently one of the most active Producers / Engineers in the industry. Dave has recorded, produced and mixed hundreds of Records and singles for a variety of genres including pop, rock and metal. All this bringing a wealth of experience and some impressive accolades whilst working with some of Australia's biggest names. All of Dave's work is easily accessible as either a charting release or clicking on his biography. industry for 20 years and has a wealth of experience to bring your ideas to life. Being a seasoned musician, performer, songwriter, and Producer, he has the skillset to help an artist achieve any sound Requested. In addition to working with recording artists, Stevie is the lead singer for rock band, The Dead Love who are still active and successfully touring and have been featured on Video Hits. He is also a competent drummer, guitarist and bassist. As well as being a talented producer & songwriter, Stevie also has a wealth of experience in television working behind the scenes for four years. 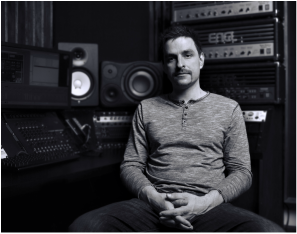 Rich Mammoliti is an upcoming producer who has been a part of the music industry for 10 years. Working within various genres his experience brings a unique sound to each project he is involved in using skills in composition, programming, and guitar. Writing and performing in Pop rock band Breakaway, he has contributed to music that gained both Australian and International TV and radio play.